Have you ever analyzed your Kentucky ancestors? If you get back far enough, you will find that many came from Virginia. Did you know that Kentucky was part of the Virginia Commonwealth? By following wars and the laws, you may be led to your early Virginian and Kentucky ancestors. Looking at early Kentucky maps, it becomes apparent that south of the Green River is consistently designated as reserved territory. This is really obvious when researching the Mammoth Cave area in south central Kentucky, which is now a National Park, but at one point this massive set-aside land was the home of about 13 or more churches, residences and many cemeteries (few still remaining). Our research of this Mammoth Caves National Park and a few targeted early residents carried us back to the Revolutionary War and the French and Indian War. Yet Kentucky did not become a state until 1792. An often forgotten war in our genealogy research is the French and Indian War, 1754-1763. Perhaps you haven’t traced that far back yet, but it will probably prove to be significant in your Kentucky ancestors’ research. This war between British American and New France colonies left a paper trail since Virginia soldiers’ were awarded land grants in lieu of pay; leaving the researcher a wonderful collection of early Virginia-Kentucky ancestors’ land records. (The same is for Virginia-Ohio ancestors). What are Bounty Land Warrants? Our early military-active ancestors were enticed to join war efforts by the promise of “bounty land warrants.” Soldiers were able to first apply for the coveted warrants. If granted, the warrants on file confirmed the soldier and the number of bounty land acres he was entitled to based on his rank and other useful genealogical data is provided. Bounty land acres were reserved specifically for the purpose to pay for military service. For Virginia militia, land was set-aside in “Kentucky” for the soldiers (or heirs) to claim. 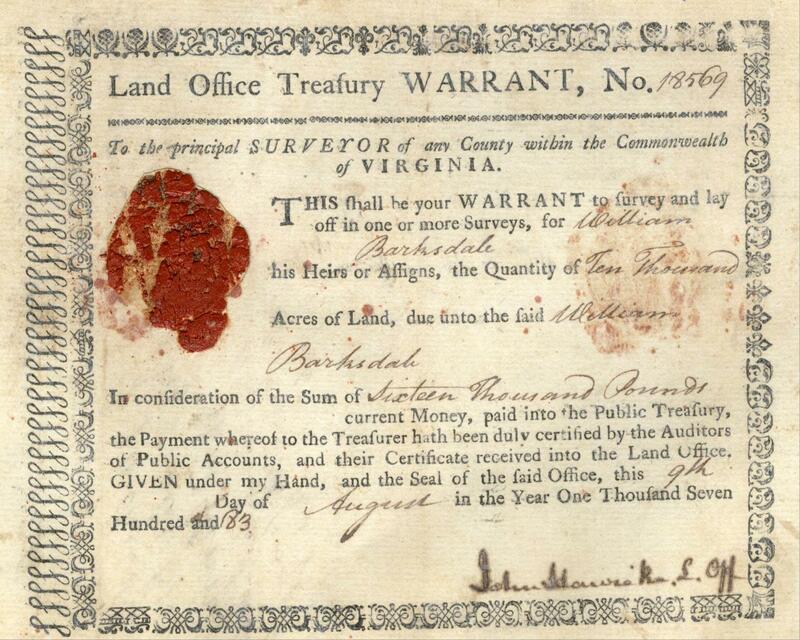 Between about 1773 - 1792, Virginia soldiers, or their heirs, received warrants for bounty land. The land was located in what is Kentucky today. After the Revolutionary War, Kentucky was formed and designated from Virginia. Virginia Revolutionary War soldiers were also offered bounty land in Kentucky and Ohio. 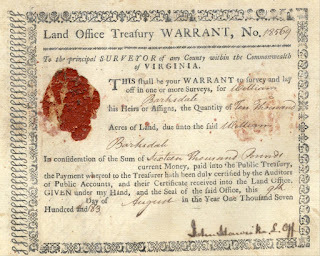 At least 4748 bounty land warrants were issued by Virginia to Revolutionary War veterans. The warrants authorized surveys of the soldiers’ land. A soldier was able to surrender his bounty land warrant for a land patent, resulting in ownership of the land. The original warrants are held at the Kentucky Land Office, in Frankfort, KY and have been microfilmed by the Family History Library (FHL): Virginia Grants, 1782-1792. Be sure to also review the Old Kentucky Grants (1793-1856) microfilms held at the FHL. A vital resource to our Mammoth Caves area research was the FHL microfilm rolls of the Grants South of the Green River, 1797-1866. The land south of the Green river was also reserved for Virginia soldiers. Preemption Receipts and Warrants from the VA Land Commission from the Library of Virginia, Richmond VA.
One of my ancestors was given land for fighting in the American Revolution.--land in NC, as I recall. In my research in the 1600s and 1700s, It was almost 300 acres, and he was not of a high rank. I have been surprised at how readily land was granted in those days, It seems that people didn't need a title or a fortune to acquire land, unless I'm missing something. The First Settlers (1670-80) of SC at Charleston even seem to have come, sometimes, with the promise of a land grant. Thank you for these databases about Virginia and Kentucky! The Revolutionar War Warrants were part of the 9 July 1788 Act: resolution provided that a private or noncommissioned officer would be entitled to 100 acres of bounty land, an ensign to 150 acres, a lieutenant to 200 acres, a captain to 300 acres, a major to 400 acres, a lieutenant colonel to 450 acres, a colonel to 500 acres, a brigadier general to 850 acres, and a major general to 1,100 acres.